Buying a car takes patience, research and a little help along the way! 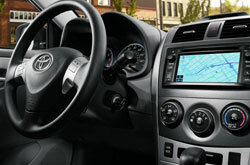 That's why Kenny Kent Toyota provides a review of the 2013 Corolla. Our Toyota reviews are compiled by veteran automotive writers - it's just another resource we provide as a prominent Toyota franchise in Evansville. This article will tell you exactly what you're looking for. 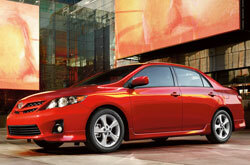 As your Evansville Toyota franchise, you can be sure of on us for authentic information on the 2013 Toyota Corolla. Happy hunting! When considering the 2013 Toyota Corolla alongside the 2013 Ford Focus, Chevy Cruze and the Honda Civic, and you can notice that the Corolla beats out those autos in many parts. Take a look at the hightlights below. Feel the [resassurance] that comes along with receiving quality repairs by Toyota trained technicians, a generous warranty on all work, and trustworthy Toyota parts. At our Evansville area repair center, this and more is available for Toyota Corolla drivers. Keep your Corolla running healthily; have it serviced by Kenny Kent Toyota's masterly car repair mechanics. We can take care of a manageable chore as an oil change, or deliver quality tough Toyota Corolla service and repairs like strut and shock repairs, timing belt replacements and Corolla transmission rebuilds. For budget-friendly, quality Toyota car repair in Evansville, the top place you should take your Corolla is Kenny Kent Toyota. Click the succeeding link to find wallet-friendly service specials now!